We’re back from Indianapolis after delivering one of our cats to our daughter and family. We stayed three nights, to see the family and for the cat to get adjusted to her new situation. I offered to go get some cat food, but our daughter and granddaughters would not allow me near the pet food aisle after my last blog! I don’t know what it is but whenever I visit them I go into “vacation mode” – I don’t feel like doing anything. I just want to relax. This is not fair to them. We help take care of three (sometimes, five) grandchildren in Lansing; then have four when we visit Indy. Our family Sunday ended up being a day in front of the television with our granddaughters who introduced us to the British series “Father Brown,” available on Netflix. It was actually quite good, though some things did irritate me. For example, whenever the priest prayed in Latin, the closed-caption subtitles simply said: “Prays in a foreign language.” Don’t most people know that Latin has been the lingua franca of the Catholic church for almost 2,000 years? Family members are all trying to be healthier, which meant no junk in the house. If I had remembered that, I would have taken some goodies to nibble between meals. I was so hungry, at one point I called our daughter in Lansing and said: “Can you come down immediately and bring some food?” I was just being humorous – it’s a 4+ hour drive; and I could have gone to a local grocery store if I thought I might expire. Mike, our son-in-law, is a very good cook and the food was excellent. I decided to join the healthy eating and then continue it at home, which is what I’m now doing. I feel better already. I’ve had no indigestion for a week and feel more energetic. The dog food last week probably helped. It was really nice to have a break from everything, including world news. Trump called immediately for Congress to abolish the Diversity Visa Waiver program. This is a lottery that enables 50,000 people a year from usually poor and backward countries to enter the United States. They may then sponsor their relatives and friends to enter the US. Tuesday’s murderer brought in 23 over 15 years. Most of these people go straight to the bottom of our economic ladder, competing for jobs with low income Americans. President Trump immediately called on Congress to change the law. That’s commendable. The law needs to be changed. But, then, why didn’t he react the same after the Las Vegas mass shooting? Changes to the law are desperately needed. It’s been over twenty years since the Port Arthur massacre in Tasmania, Australia. 35 people were killed in a little over half an hour. The conservative prime minister, John Howard, immediately called on parliament to pass tough controls on assault weapons. “Twelve days after the Port Arthur massacre, the Australian prime minister, John Howard, announced a sweeping package of gun reforms in a country where firearms had long been considered an essential prop in the national mythology of life in the bush. “Tim Fischer was leader of the National party and Howard’s deputy prime minister in the Coalition government, charged with persuading skeptical country voters to support, or at least accept, reforms. “Port Arthur was our Sandy Hook,” he says. “Port Arthur we acted on. The USA is not prepared to act on their tragedies.” (The Guardian 14th March 2016). The Sandy Hook massacre of kindergarten children took place on December 14th, 2012. Congress did not pass any laws following the deaths of 26 people, including 19 children. If the country could not make any changes after the deaths of so many young children, it’s doubtful they will ever come. Then, when will it be the time? Immigration policies make the situation worse – the killer at Virginia Tech ten years ago was from South Korea. The Boston Marathon killings were also the work of new arrivals. Today, the US definitely has a “well regulated militia,” so America’s needs have changed. At the same time, people do have a right to defend themselves. There’s a balance. It’s time for a national debate. On the highly successful Australian TV show, “Janet King,” Janet, a senior employee of the Crown Prosecution Service (CPS; sometimes referred to as “Crownies”), is appointed by the country’s Governor-General to head a royal commission into gun violence. It’s time the United States had a presidential commission to look into mass casualty gun violence, with the remit that it report back to the president and the public within twelve months, making recommendations to effectively reduce gun violence. Before we leave the Antipodes, New Zealand has a new, radical prime minister. Jacinda Ardern is only 37 and the third female leader of the country. She wants to restrict immigration into New Zealand – one of her first acts was to ban the sale of homes to people living outside of the country. She is a left-wing republican, meaning she would like to end NZ’s relationship with the Crown thereby giving greater power to the politicians, of which she is the chief! Interestingly, she is also a former Mormon who has strong views on churches that encourage families to shun former believers like herself; she left the church over its anti-homosexual stance. QUOTE: “President Xi (of China) believes that America is in steep decline and China rising in a power game that will define our century” (Carrie Gracie, China Editor, BBC News, 11/2). President Trump is about to visit China. 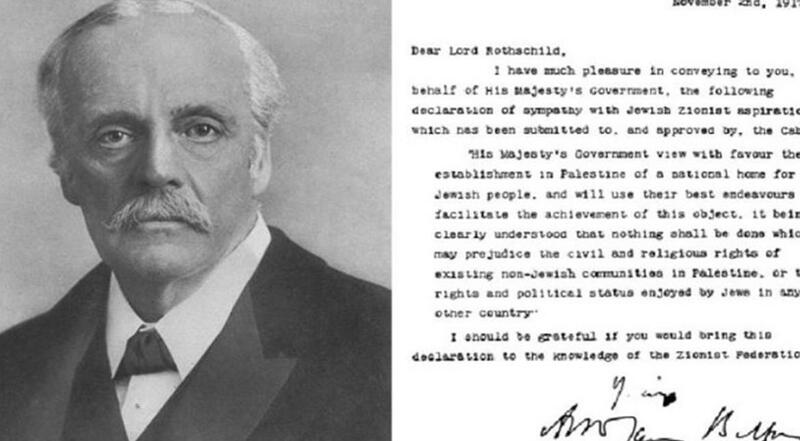 Today, November 2nd, is the centenary of the Balfour Declaration. Israeli Prime Minister Benjamin Netanyahu is in London to commemorate the celebration, boycotted by the anti-semitic socialist Labour Party of Jeremy Corbyn. The famous Balfour Declaration was announced in the middle of World War I by British Foreign Secretary Arthur Balfour, at a time when Great Britain was the dominant power in the world. It committed His Majesty’s Government to establish in Palestine a home for the Jewish people. It was one of the most important documents of the twentieth century and a major fulfillment of Bible prophecy. It led directly to the establishment of a Jewish nation in the Middle East, the country now called Israel. An independent Jewish nation had not been in existence since Roman times. The Roman Jewish province of Judea rebelled against Rome in 66 AD. The Romans crushed the Jewish Revolt in 70 AD, destroying much of Jerusalem in the process. The Jews rebelled again from 132 AD-135 AD. Once again, the Romans crushed the revolt. This time, the Jews dispersed to other parts of the Roman Empire and beyond. For almost two millennia, they did not have their own country. But scriptures made it clear that the Jews would be back in their homeland, called Judah in the Bible (the Jews were only one of the twelve tribes of Israel). Zechariah was a prophet 2,500 years ago. His Old Testament book is a Millennial prophecy about the Second Coming of the Messiah. Judah figures quite prominently in events at the time immediately prior to Christ’s Return. And Zechariah 14:2-4 – “For I will gather all nations against Jerusalem to battle; and the city shall be taken, and the houses rifled, and the women ravished; and half of the city shall go forth into captivity, and the residue of the people shall not be cut off from the city. “Then shall the Lord go forth, and fight against those nations, as when he fought in the day of battle. The last verse is clearly still in the future. Jerusalem, Judah, revived after almost 2,000 years is once again a central point of geographical contention, with neighboring nations and tribes wanting to destroy the country. As if perpetually drunk, they desperately try to destroy her, so far not succeeding. Five days after the Balfour Declaration, Russia had a second revolution. Earlier in the year, the Czarist regime had fallen and was replaced by a parliamentary system. Elections were scheduled for later in the year. Two weeks before the election, the Bolsheviks (communists) staged a coup on November 7th that overthrew the interim government of Alexander Kerensky. They proclaimed the world’s first communist state. It brought seven decades of misery to the country, with despotic leaders that made the czars look like Sunday school teachers. Communism has gone, but the country remains a dictatorship, though claiming to be a democracy. The Bolshevik Revolution was the second revolution of 1917; there was an earlier revolution in 1905, which led to the establishment of the Duma (parliament) but still left the czar with ultimate power and authority. Russia’s parliament today is also called the Duma and is the people’s assembly. However, some would say that Vladimir Putin is a new Czar, with all the power and authority. Tuesday was the 500th anniversary of Martin Luther nailing his 95 theses to the door of the Wittenburg church in Germany. We should all be thankful to Martin Luther. He had the courage to stand up to the Church of Rome, ending the monopoly the Church had in western Europe. All churches today owe their freedom to Luther. I watched a two-hour documentary on PBS recently about Martin Luther and the Reformation. He is considered the greatest theologian of all time, due to the fact that he wrote more books and articles on the Bible than anybody else. He also translated the scriptures into German. Later in life, asked to sum up his writings, he replied: “God forgives.” That was of paramount importance to Luther, who struggled all his life with sin, as we all do. Hearing that, I thought about all the churches that have come out of Luther, directly or indirectly. Many have one thing in common – they can’t forgive. How ironic. Earlier in the month, we were in Cincinnati, Ohio. A group of us, including four of our grandchildren, took the opportunity to visit Noah’s Ark, which is just over the state line in Kentucky. It’s well worth a visit, if only to get a better idea of the size of the original ark. This replica is built according to biblical specifications. I’m very thankful that the enterprising Australian behind this project was inspired to build the Ark (and the Creation Museum nearby). More and more people are biblically illiterate, so it’s good that somebody has kept the story alive. I found the wall plaques explaining everything interesting, but I do not agree with his theory that the earth is only 6,000 years old. We had been told to allow three hours for our visit. With two 5-year-old twin boys, we went through quite quickly, in exactly two hours. We left early — because it was raining!!! The following evening we had a group of Barbadians over for dinner. Wonderful people. They had actually come from Barbados to visit the Ark. They are also Young Earthers, believing in the 6,000 years. We agreed to disagree and still remain friends. That’s the way it should be. I’ve been asked why I quote so often from the Daily Express and Daily Mail newspapers, two Conservative British tabloids. The answer is quite simple: they have the best web sites. Check them out sometime. The Guardian and Independent, more intellectual papers, are constantly asking for money whenever I check their sites; whereas the Times, the Telegraph and the Financial Times make very little available. The biggest problem with the two papers I use is that they often sensationalize news items. I will try to find alternative sources, but, realistically I will have to use them occasionally as I don’t have the funds to pay for subscriptions to the more highbrow papers; and they have to request money as they have smaller circulations.